Baldness occurs due to permanent loss of hair roots esp in front and crown of scalp due to sensitivity of male hormones. No medication can reverse this hair loss. Hair transplantation is an outpatient procedure done under local anesthesia. Hair Transplant is procedure where the roots of the hair follicles from the back that are poorly sensitive to the hormones that damage them are transferred to the desired areas surgically. It is well known that hair on the back (occipital) region of the head almost never fall off (due to a genetic tendency to remain permanent as they are less sensitive to male hormones). HT is based on the concept that if hair roots taken from the back region are transplanted to the area of baldness, they will, after a short period of effluvium, continue to grow hair in the new site for as long as they would have in their original site. 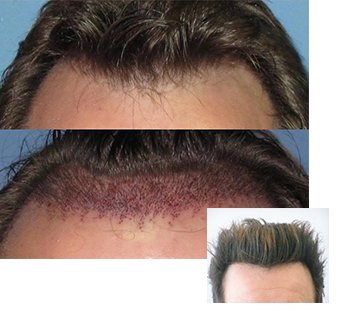 Follicular micro or mini grafts are used to provide the desired density of hair. Since the new transplanted hair is from one's own body, it will grow naturally with time & one can shampoo, trim or even shave it. In FUT (Follicular Unit Transplantation), hair has traditionally been harvested using a long, thin donor strip that is subsequently dissected into individual follicular units with the aid of special microscopes. In Follicular Unit Extraction (FUE), individual follicular unit grafts can be removed directly from the back and sides of the scalp using a small, round, 7-mm punch-like instrument. Result wise FUT is the best no doubt in this. Here 100% result you get with good hair quality but the problem is linear scaring on back side of head. May be after 20 year when you will losse all your hair then it looks ugly. It's costs half of the FUT and DHI. if you don not want any type of scars and result that is bit low	er than FUT the FUE is the best option. Single follicles are extracted from donor area so no scars. Compare to DHI it takes more days to heal in both donor and recipient area( 12 to 20 days). And in one its not a good idea for more than 2500 graft. So if more grafts is needed for you then you have to get it done in 2 to 3 sessions.